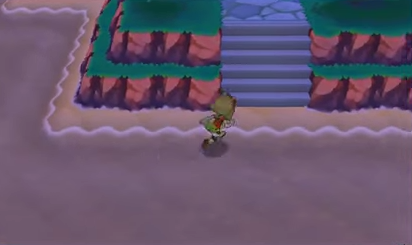 - In order to reach Mossdeep City you must leave Lilycove City and Surf east across Route 124. There are a few trainers in the way, but they're very easy to skip. We'll explore Route 124 in a subsequent article, when we have an important HM in our repertoire that can only be gained by visiting Mossdeep. - Check the outskirts of Mossdeep. There's a series of shallows in the east, and on one small patch of sand you'll find a Big Pearl. - Near the entrance of Mossdeep from the beach is the local Pokemon Center. Nothing special in here. Next to it is the Poke Mart; speak to the girl in the rear of the Mart and she'll give you TM60, Quash. - Run along the southern edge of Mossdeep Island. To the right of an old man who's staring at the sea is a Net Ball. To the east of the old man is a solitary house; inside is a Hex Maniac who will tell you which pokemon you had on your team when challenging (and completing) your various Gym Challenges. - Head up the stairs to the left of this house. Follow the path as it winds northwest to find a house. Inside is a fisherman who will give you a Super Rod, the best of the three Rods in the game. A short distance from his house you'll find a Revive, on the edge of a small cliff. North of here you'll find a path down to a rocket launch pad; look on the right side of the rocket for a hidden Iron. - Head south along the path and take a right. At the top of the northern stairs you'll find the Mossdeep Space Center. Not much to see in here right now, but if you speak to the sailor in the top-left corner of the Center's first floor he'll give you a Sun Stone. The second floor looks nifty, but it's actually rather useless. May navigates the oddity that is Mossdeep's Pokemon Gym. Mossdeep's Pokemon Gym is pretty funky. It resembles Pac-Man to a degree, and consists of dotted paths that will allow you to hover in a variety of directions. Manipulating the pedestals on the destination platforms will reorient these paths and send you to different areas. Note that you must step on the large circle of light to use a dotted path; smaller dots won't send you on your way. The pokemon in this gym are almost universally psychic-types. This makes them quite adept at special moves, but it also makes their weaknesses predictable. Dark-types can, for the most part, murder the Mossdeep Pokemon Gym. Fairy-types are also quite good, and so long as they don't have poison-type shacked up as well, ghost-types are pretty good in here. Make sure you have at least two pokemon that aren't terribly vulnerable to psychic-type moves, because, well, reasons. You'll see when you get to the end of the gym. - The first line of light will shunt you to a nearby platform with a trainer. Interact with the sole pedestal here to change the path of the light from the first platform, as well as create a path back to the beginning of the gym. Not difficult. It just doesn't have the defences to survive. - Hop on the light from the entrance. Another trainer, another pedestal. A bit tougher, as Medicham bucks some psychic-type trends, but you can slaughter it with a fairy-type move. - Lighting this pedestal will create two more paths. If you take the bottom one you'll return to the entrance and have to face an extra trainer before reaching the top-right platform in the gym. Kirlia kinda puts the kibosh on fairy-type offensives, but isn't terribly strong. Grumpig is hefty and can use Teeter Dance, and, if you're unlucky, Rest. Beware. Claydol is tough, but it kinda wastes its turns with Guard Split. Not difficult. Starmie can be difficult, but it tends to use weaker normal-type moves. Meh. - Another pedestal, but this time, two westbound choices. 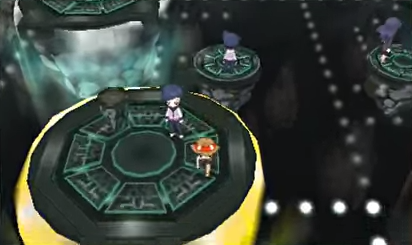 The upper circle will take you over to the Hex Maniac from earlier; the lower circle zips you over to another trainer. - Illuminate her pedestal to create two more pathways. The right will take you to a trainer you can't possibly avoid. The left will take you back to an earlier platform, which, in turn, will return you to the entrance. Kadabra is strong with Psychic, but easy to knock out. Girafarig is not as powerful, but it prefers physical moves and can take more abuse. - Now that you've done a circuit of the gym, the northern path from the entrance will shunt you riiiiight to the gym leader... or, in this case, leaders. 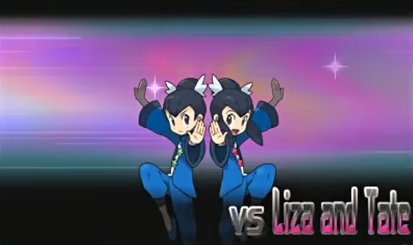 Liza and Tate, the joint gym leaders of the Mossdeep Pokemon Gym. Ooo, a double battle. Swanky. Though they only have two pokemon, Liza and Tate are reasonably tough. Lunatone and Solrock complement one another pretty well, putting up Light Screen to increase their special defences and battering you with Psychic. You may also see Calm Mind every now and then to improve their attack scores, which can be especially dangerous if Solrock throws up Sunny Day and starts battering your team with Solar Beam. Focus on them one-at-a-time, preferably using special attacks to take them out before they put Light Screen in play. Solrock is the more dangerous of the two in the long run, so try taking it out first. You can also negate most of its advantage by changing the weather with, say, Rain Dance, then Surfing them both. Liza and Tate are Hyper Potion-happy, so be prepared to chew through these HP scores more than once before winning the fight. Defeating Liza and Tate will earn you the Mind Badge, allowing you to control pokemon up to level 80 in battle. You can also use the HM move Dive outside battle, which you'll get shortly. Last, they'll hand over TM04, Calm Mind, which is quite handy for special attackers.